Today was the first day of YEC West at First Baptist Church Roanoke! YEC stands for Youth Evangelism Conference. My husband and I work this conference every year as well as the youth camp that the same organization puts on every summer. We absolutely love doing it! We have worked the camp and conference every year since 2008 and it's always a great time! We have become close friends with many of the other staffers and we are constantly smiling and laughing with them. Our first couple of years we did other staffer tasks and jobs but after that we've been working on the media team which is so much fun. My husband actually works with the company that does all the media now. 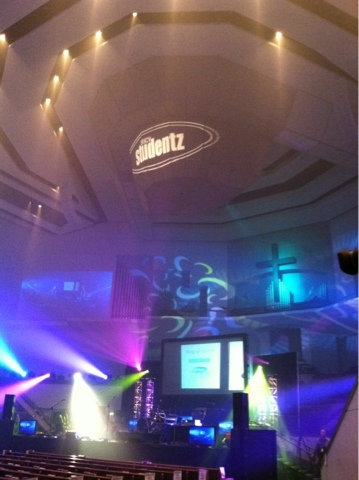 If you want more info about the camp, conference, or other SBCV events, check out their Studentz page. As for me, it's off to bed as we have a full day tomorrow of YEC!